BULLOCK, WILLIAM, naval officer, Church of England clergyman, and hymn-writer; b. 12 Jan. 1797 at Prittlewell, Essex, Eng. ; d. 7 March 1874 at Halifax, N.S., and was buried in Camp Hill Cemetery. William Bullock was educated at Bluecoat School in London. He entered the navy as a midshipman on the Mutine 15 Dec. 1815, and served at the bombardment of Algiers under Lord Exmouth [Edward Pellew] in 1816. Later, he joined the Snap as sailing-master’s mate and assistant surveyor. The ship did extensive hydrographic surveys around the coasts of Newfoundland, where Bullock was disturbed by the apparent neglect of the spiritual needs of the people. On 4 Nov. 1821 he was officially discharged from the navy for reasons of health, and immediately offered to serve in Newfoundland as a missionary for the Society for the Propagation of the Gospel. Bullock was ordained deacon on 31 March 1822 by George Henry Law, bishop of Chester, and raised to the priesthood two weeks later by George Pelham, bishop of Lincoln. He was appointed missionary at Trinity Bay, Newfoundland, in 1822. In 1823 he married Mary Clinch, daughter of John Clinch*, the former missionary at Trinity; they had ten children. Bullock was extremely popular with the people of his extensive mission, serving them as pastor, doctor, and magistrate until 1840. After a brief period in St John’s, he left for the mission of Digby, N.S., in the summer of 1841. Here he set to work with his usual energy and zeal, building four new churches and establishing several preaching stations. The latter were usually points at some distance from the main mission where the missionary occasionally held services. To hold the congregation together, he appointed some worthy layman, frequently the schoolmaster, to read prayers on the Sabbath. These centres often obtained the services of a regular minister and built churches of their own. Four preaching stations, Sandy Cove, Briar Island, South Range, and Roseway, which Bullock established, later built churches. Bullock went to Halifax in 1847 for temporary duty, and in June of that year Bishop John Inglis* appointed him curate of St Paul’s Cathedral; he also assisted in the work of supplying outlying missions. In 1848 he was placed in charge of St Luke’s Chapel of Ease in addition to his work at St Paul’s. When St Luke’s became a separate parish in 1858, he was appointed its first rector, and under his leadership St Luke’s became a very active church. On the death of Bishop Inglis in 1851, Hibbert Binney* had been appointed to the bishopric. In 1864, on Binney’s urging, letters patent from Queen Victoria made St Luke’s the cathedral church of the diocese of Nova Scotia. And since Bullock sincerely believed in the catholicity and mission of the Anglican Church, views totally in accord with the beliefs of the new bishop, Bullock’s appointment as first dean of the new cathedral was not unexpected. He was assisted at St Luke’s by George McCawley, president of King’s College. During much of his life Bullock was obsessed with the fear that he would leave his wife and children destitute, but his appointment to St Luke’s removed this problem. In 1854 William Bullock published a collection of 166 hymns, Songs of the church, which he dedicated to the SPG. The best-known of these, “We love the place, O God,” composed for the opening of a new church in Trinity Bay, was later inserted in the official hymnbook of the Church of England. He frequently contributed devotional poems to the Church Times and sent birthday and anniversary greetings in poetic form. Bullock was a man of tremendous energy and enthusiasm. He had a strong sense of duty to his parishioners, and was highly respected by his contemporaries. Chester Records Office, EDA/1/10, Bishop of Chester’s act book 1809–25. Lincolnshire Archives Office, Ord. Reg., I, f.7. PRO, Adm. 37/5904 (muster book of hms Mutine); 37/6760 (muster book of hms Snap). USPG, Journal of SPG, 33, p.254, 15 March 1822; SPG, C/CAN/NS, letter of William Bullock, 13 Sept. 1841; letter of John Inglis, 17 May 1847. R. H. Bullock, A memoir of the very Rev. 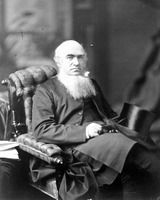 William Bullock, D.D., dean of Nova Scotia (Halifax, 1899), 5, 25, 33. Harris, Church of Saint Paul, 207. C. E. Thomas, “BULLOCK, WILLIAM,” in Dictionary of Canadian Biography, vol. 10, University of Toronto/Université Laval, 2003–, accessed April 24, 2019, http://www.biographi.ca/en/bio/bullock_william_10E.html.